Based on the life skills curriculum of the Ministry of Education, Youth and Sport, we have prepared the sewing skills module for lower secondary male/female students. The content of each lesson in the module is related to daily life which is being popular in our contemporary society. The life skill of sewing subject is very beneficial because it’s the pre-vocation that provides knowledge and experience to teaching staff in this section, and for student body to understand the features of using hand stitches and preparing the tool when sewing. In addition, they can develop skills in measuring, drawing, sewing and the way of preparing material for making simple shirts for women, men or infants. Through this study,. 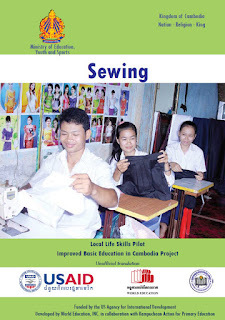 it is possible to promote individual autonomy of girls and boys throug providing them skills and knowledge about sewing, which is really useful in daily routine and related to life care to both females and male students. The life skill programme of the project is short, only ten weeks equal to only twenty hours; we have selected some vital lessons about sewing using hand stitches. The preparation of lesson plans for teaching in this module includes direct reaction from girls and boys in the classroom whereas teachers are just their mentors and to facilitate them so as to achieve the objectives. The document is the first compilation with creativity and simple methods aiding facilitator of sewing subject (can be teaching staff or community) in order to use and pilot it in the implementation of the life skill programme.